Livingston County Offender Success is bringing the joy of gardening to its returning citizens. The garden was built at one of the transitional houses that keep returning-citizens safe and off the streets. Staff from Catholic Social Services of Washtenaw County worked with multiple agencies in Livingston County to make the garden possible. A $100 Meijer gift card donation from Gleaners Community Food Bank paid for tools, seeds, seedlings, and fencing to keep critters out of the garden. 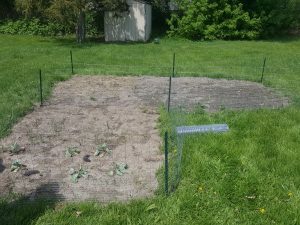 The Gleaners Community Food Bank Community-Garden Coordinator, Courtney, worked closely with Tiffany Snay, CSSW’s Livingston County Offender Success Resource Specialist, to plan a day to dig the garden. Courtney even provided a rototiller to prep the land. Unfortunately, when the big “dig day” came, said rototiller stopped working. But that didn’t stop the aspiring farmers living at the transitional house. They just grabbed some shovels and got to work. Together, the men created a garden bed—a little space for something new to grow. They planted Nasturtium (edible flowers! ), peas, green beans, okra, strawberries, cucumbers, tomatoes, onions, arugula, swiss chard, and a variety of herbs—right along with their hopes for a better tomorrow. But the local groundhogs seemed to have other plans. Fearing their garden would be compromised at its roots, the gardeners reached out to their network of resources to obtain two traps. The groundhogs were safely caught and re-settled at Kensington Metropark. St. Agnes’ parish in Fowlerville heard about the Offender Success garden through staff from the Gleaners Community Food Bank, and have since expressed interest in funding the program so it can expand! Any overflow produce from the garden will be donated to one of the numerous produce stands in Livingston County. Next on the gardeners’ wish list: a rain barrel to minimize water cost.